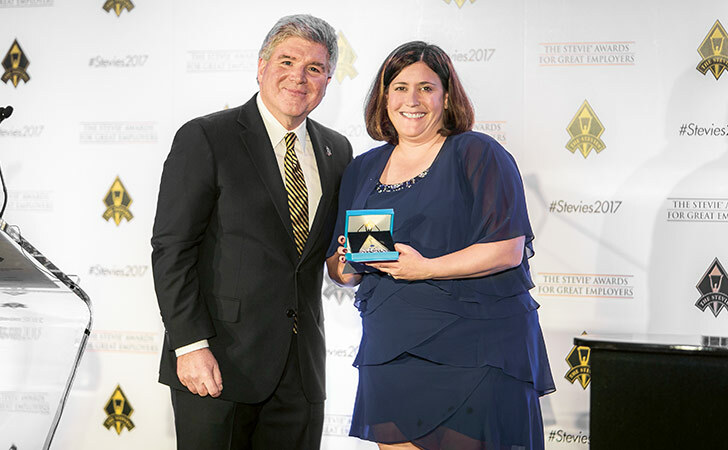 Jennifer Reid of Finance Reinsurance Americas collects the STEVIE Silver Award we received for an interactive new finance training programme. Swiss Re won the STEVIE Silver Award in the area “Achievement in Workforce Development and Learning” with the new Finance Week Development Programme – a new approach to learning. The newly introduced programme provides an interactive and innovative learning experience that expands our finance expertise and differentiates us from competitors. The objective of the event was to improve the finance acumen of the Reinsurance organisation. A total of 530 employees participated in 40 events and trainings as part of the Finance Week in Zurich, Switzerland in 2017, and 260 participants attended in Armonk, US with 25 events and trainings. Over 50 internal and external experts shared their expertise and we embedded the 70/20/10 approach to modern training.